I was invited to stay in Ironbridge as a guest of Puddle Duck Cottages. Ironbridge and the surrounding area is the perfect location for a long weekend away. 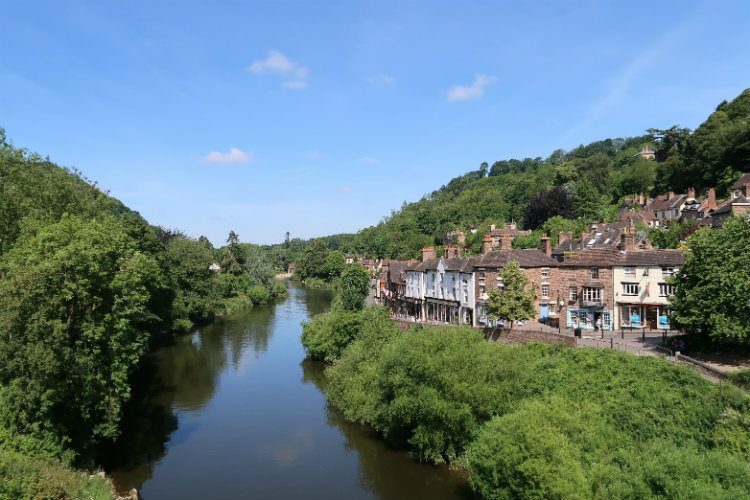 Although it’s only an hour or so from Birmingham, and close to the busy town of Telford, the Ironbridge Gorge is a wonderfully tranquil spot in the Shropshire countryside. But that doesn’t mean there’s nothing to do! In fact, your hardest decision could be what to leave out of a weekend in Ironbridge. Whether you are a history buff, an antiques enthusiast, a nature lover or an outdoors type, you’ll find something to suit your taste. And if your perfect weekend involves browsing through quirky little shops and eating good food? Well, Ironbridge has got you covered! Here’s my suggestion for a long weekend in this historic town and the surrounding environs. And this itinerary can easily be adapted if you are only spending 48 hours in Ironbridge. This itinerary is set out for visitors staying at the Puddle Duck Cottages or Jackfield. If you’re staying in Ironbridge itself, you may wish to swap the itineraries for Saturday and Sunday. If you’re visiting Ironbridge from outside the UK, the closest airport is Birmingham International (45 miles/72km). From there you can either use public transport or hire a car and drive to Ironbridge. Ironbridge lies in the heart of Shropshire, but it’s fairly easy to get to. The nearest motorway to Ironbridge is the M54, and you should leave at Junction 4 for Shifnal. From there, it’s about a 12 minute drive into Ironbridge, mainly on A roads. If you are travelling by public transport, unfortunately Ironbridge doesn’t have a train station. The closest station is Telford Central, and you can easily take a taxi or use Arriva bus service 18 from Telford to Much Wenlock. To enjoy the Ironbridge area at its very best, I can highly recommend staying at Puddle Duck Cottages. These two luxury self-catering cottages date back to the days of the Industrial Revolution. I was recently invited to stay in Puddle Duck Cottage with my family, and we all throughly enjoyed our visit. Click here to read my review or here to see a video tour of Puddle Duck Cottage. There are plenty of other options for hotels and guest-houses in Ironbridge. These include the Malthouse with its kitschy rooms, and Bridgeview Guest House with its unrivalled view of the Iron Bridge itself. When you arrive in Ironbridge, the first thing you will want to do is probably to unpack and put the kettle on. If you’re staying in the Puddle Duck cottages, take a while to explore your historic accommodation. They’re full of character, and you’ll enjoy discovering all the quirky features of the cottage. And your welcome to the cottage will include tea, coffee, a bottle of wine and a cake – perfect to help you settle in! Once you have unpacked and explored the cottage, you may have time to go out and explore the area a little. Puddle Duck Cottage lies in the village of Jackfield, which is about a mile downstream from the town of Ironbridge itself. The area is rich in industrial history, and there are signs dotted around which will help you to imagine how it may have looked in the past. There are several restaurants and pubs serving food within walking distance of Puddle Duck Cottage. So why not call into one of these for dinner on your first evening in the area? And if your pooch has come on holiday with you, you’ll find that several of them are dog-friendly. After a good night’s sleep, and a hearty breakfast, you’ll be feeling refreshed and ready for the day ahead. In your welcome pack from Puddle Duck Cottages, you will find details of a circular walk which takes you through Coalport and the surrounding area. You’ll cross over the Jackfield Memorial Bridge, and also over Coalport Bridge. This was built in 1818 from cast iron, but is not quite as famous as the bridge a little further upstream! The walk also takes in the Hay Inclined Plane, which is a railway which runs directly into the Coalport. This was an ingenious way of transporting goods down from the top of the Ironbridge Gorge without needing to use a series of canal locks. And if you have time, why not call into the Coalport China Museum on your walk. The museum is based in former factory buildings which now house examples of Coalport and Caughey china. It’s one of the 10 museums which make up the Ironbridge Gorge Museum Trust. A Passport ticket is available which will allow you entry to all 10 museums for a year. There are plenty of options for lunch in the Jackfield area. The Half Moon Inn overlooks the River Severn, and is a lovely place for a sandwich and a cold drink at lunchtime. In the summer months, they have an outdoors bar and BBQ. You could also stop off at the Woodbridge Inn on your walk, which is a lovely dog-friendly pub by the river. They even have dog biccies on the bar! After a refreshing lunch, you’ll be ready for the next part of your weekend. Jackfield Tile Museum is about a 10 minute walk from Puddle Duck Cottage and is a great way to spend a few hours, especially if the weather isn’t wonderful. If you bought an Ironbridge Gorge Museum Trust passport ticket earlier in the day, entry to this museum is covered by that. You can buy a passport at any of the Trust’s 10 museums. Tiles were definitely on-trend during the Victorian era, and Jackfield was at the heart of the tile industry. The museum is housed in the former works of the Craven Dunnill tile company. Within its walls, you’ll see the history of the British decorative tile industry between 1840 and 1960. This was the period during which this factory and nearby Maw & Co were key players in the industry. The museum offers a peek into the past, as you can see some of the offices as they would have been at the height of Craven Dunnill’s tile production days. There are galleries of the company’s many tile designs, including some by William Morris. And you can also see examples of tiles in use. These include recreations of an Edwardian Tube station, a pub and a church. And for a more up-to-date experience, don’t forget to head into Fusion, which is housed on the same site. This building offers several artisans a space to design, create and inspire. If you enjoy looking around Jackfield Tile Museum, then do pop across the road to the Church of St Mary the Virgin to see the tiles in use. This beautiful building was designed in the French Gothic style by Sir Arthur Blomfield, and uses tiles from Maws on the floor. As this is still an active church, there are limited opening hours – click here for details. There is no charge for entry, but visitors are invited to make a donation in the collection box on their way out. As you head back down towards Puddle Duck Cottages, take a detour into the Maws Craft Centre on your way. This is the former factory of the famous Maws tile company, and now houses a number of workshops for artisans and crafts. Within the gates, there’s a charming courtyard, and it’s fascinating to wander around the different workshops. Each business keeps their own working hours, but you should find a good range open on weekday afternoons and at weekends. And there will also be somewhere to sit down with a drink and a slice of cake, should you be so inclined! You could choose from any of the nearby pubs and restaurants for your evening meal. But after all that walking, you may decide that you want to eat ‘at home’ in Puddle Duck Cottage. Luckily the cottage has a well-equipped kitchen, so you will find every utensil you could need. And there’s also plenty of cutlery and crockery. But if you don’t want to cook, why not call out for a takeaway? We ordered an Indian takeaway from Zengh in nearby Broseley, and it was excellent – they do also have a restaurant if you’d prefer eating out. You’re now half way through your weekend. And after another peaceful night in the Shropshire countryside, it’s time to head into Ironbridge. You could take your car, as there are a number of car parks around the town. At the time of writing, they don’t currently take cards, so be sure to have plenty of coins with you. Parking wardens do patrol the town centre regularly. But why not take a stroll along the footpath into town, underneath this beautiful canopy of trees. It’s very peaceful, and you’re not in a rush! Soon you’ll see the beautiful and quaint town of Ironbridge itself, sitting on the edge of the River Severn. You’ll need to cross over the river to reach the main town centre, which of course means crossing over the Iron Bridge. Ironbridge of course take its name from the Iron Bridge which spans the River Severn. The bridge was erected by Abraham Darby III in 1779 and opened to the public in 1781. It was the first major bridge in the world to be made from cast iron, and the area became known as the birthplace of the Industrial Revolution. Now the Ironbridge Gorge is a UNESCO World Heritage site. At the moment, the Bridge is under wraps as it undergoes a £1m renovation. The wraps should come off in late 2018, and you will then be able to see the Bridge as it appears below. Once you have crossed over the Bridge, you will be on the main street through Ironbridge. Here you will find plenty of little independent shops and stores, cafes, restaurants and pubs. But happily, what you won’t find is a lot of national chain brands. Take your time to explore the town, and pick up some souvenirs. Maybe even try a personalised pork pie from the world famous Eley’s of Ironbridge! If you’re in the mood for more history, then you can call into the Museum of the Gorge, or look in the original Toll House. These only take a short while to visit, and they are both covered by the Ironbridge Gorge Museum Trust passport. It really is fantastic value for money. You’ll be spoiled for choice when it comes to lunchtime today. There are many fantastic pubs and restaurants along Tontine Hill and the Wharfage, and further out into town. During our weekend visit, we had lunch in The Swan Taphouse, which offers a tantalising mix of British classics and American pit BBQ food. It’s become a family favourite and we’ve made several return visits since then. Or you could pay a visit to Darby’s 1779, the tea room attached to the Bridgeview guest house. They open from 8am for breakfast, and also offer lunches and clotted cream teas, all with a fantastic view of the Bridge. How will you choose to spend the final part of your weekend in Ironbridge? There are some great options still open to you, depending on your interests. There are still some of the museums that you haven’t covered yet. These include the Museum of Iron in Coalbrookdale and the beautiful Darby Houses, which are former homes of the Darby family. Families may fancy exploring science and engineering at Enginuity, or you can take a trip back in time at Blists Hill Victorian Town. That could easily fill a full day of your visit on its own though! If mooching around an antiques shop is your idea of a perfect Sunday afternoon, you’ll love the Ironbridge Antiques, Arts and Crafts Centre. They have an amazing selection of antiques, from furniture and kitchenalia to artwork and vinyl LPs. And the craft section showcases a massive selection of local craft workers. The Vintage Corner features vintage and steampunk clothes and accessories, and there’s even a Harry Potter room! And if you’re in the mood for another cream tea (and who wouldn’t be? ), then you can pay a visit to their Riverside Tea Room. Or why not take a different view of the River Severn with a raft tour from Shropshire Raft Tours. They will take you on a 60 minute trip down the River Severn on one of their 25ft rafts, which can carry up to 16 passengers. You could spot all sorts of wildlife, and see the Iron Bridge from a different angle as you glide underneath. And if you’re feeling a bit more active, you can hire canoes, kayaks, mini rafts or a mega SUP. Shropshire Raft Tours even hire out bikes and e-bikes so you can explore the cycle paths in the area. For your final evening in Ironbridge, you could choose to stay in town for dinner at another one of the excellent establishments along the riverfront. Or alternatively head back towards Jackfield and take your pick from the pubs in the area. After all of that, the time has come to say goodbye to Ironbridge. Will you have filled your weekend with masses of activities, walked for miles, drifted downriver in a raft or just enjoyed a stroll by the riverfront in town? Whatever you choose, I’m sure that you’ll want to come back and visit Ironbridge again very soon! I used to live about 20 minutes from Ironbridge and it was a place my now husband and I would go to for a day out when dating. We had some amazing cream teas there and the little town is picturesque all year round. You’ve really capture the beauty of the place in your photos. Wow what a place to visit. I love how detailed this post is and it gives me a clear idea of what i’d experience if I were to visit the area. Thanks Angela – it’s a fantastic location, so much to see and do! You have genuinely made me want to visit this utterly charming little town…and definitely will look into Puddle Duck cottage. We are more cottage/house/apartment rental people than hotel people, so it would suit us perfectly. Definitely, it should be on every bucket list! But go after November, so you get to see the Bridge in all its glory! You have some really beautiful photos Sally. It’s not a place I have thought about visiting before but I really want to now. How cute is Puddleduck cottage!? Thank you! It’s a gorgeous place, and definitely well worth a visit. Puddle Duck is beautiful, a lovely place to stay! Ironbridge sounds lovely! I love the idea of the river rafting on the River Severn. It looks like great fun – definitely something that I fancy trying myself soon! You can’t beat sitting by the river with a cold drink! Ironbridge is just gorgeous, I’ve totally fallen in love with it! The Puddle Duck cottages look lovely! The fact that they date back to the days of the Industrial Revolution, and the warm welcome with a bottle of wine and cake would be two top reasons I’d love this place. A quaint town by a river is my ideal way of spending the weekend. The cottage was so lovely, it was such a special treat to stay there! It’s funny, I never think of tiles being typically English – more Portuguese! But the tile museum sounds interesting, I love all the coloured tiles, and William Morris’ designs are fabulous so I’d love to see them. Puddleduck Cottage sounds like such a lovely place to stay in Ironbridge – you had me at wine and cake! I didn’t realise how widely used tiles were in Victorian times, until I visited the museum. And yes, the cottage made my visit extra special! Tea, coffee, a bottle of wine and a cake…I’m sold on staying at Puddle Duck Cottages. I love small villages and such of the UK so this trip seems right up my alley. The tile museum seems like it’d be fun to visit…one of my goals is to visit as many strange and unique museums as I can in my lifetime. And I love the church…it’s so beautiful! This seems like a really great trip to do with a family too! Ironbridge is a fantastic place to visit with families. The museums have lots of activities put on for youngsters, and the raft tour is definitely a great family attraction! This would be the perfect place for me: The majestic or cute medieval architecture on one hand, the beautiful lush landscape on the other – and me meandering between the both of them. Since I’m not driving, your tip taking the train to Telford and continue by bus is very helpful. I can imagine that taking the bus across this lovely scenery even adds to its charm. It’s such a beautiful location – I would very happily move there if I had the chance! What a beautiful setting and I love the welcome bottle of wine and cake. I would love the wander the town and the quirky shops are a bonus. It’s gorgeous! I’m lucky that I only live about 30 minutes drive away, so it’s easy for me to pop back for a cream tea and a wander! Such a detailed guide to Ironbridge Shropshire. I see the possibility of having a complete holiday experience here. That tile museum is high on my list, so unique and then the river tour. Love the pictures. It has lots to see and do, but you could also combine it with days out across the area – it’s definitely a perfect holiday location! The cottages look so nice. Very cool that they come with a fully equipped kitchen to eat in. I also like the landscape. Very pretty. I have never heard of the area. The kitchen was so lovely, I wanted to take it home with me!! You’re so right that this is the perfect long weekend vacation spot! This is actually my first time hearing its name too and really wish I’d known about it sooner and visited while I was still in the UK. The price for the bridge renovation definitely took me by surprise though seeing how small it is in your photo. Well, the views and sceneries are stellar for sure so worth the price to pay! The bridge is small, but over the years it has had a lot of work to keep it standing and safe for people to cross. This renovation will make sure that it stands for centuries in the future. And it’s such an important part of world heritage that the money is definitely well spent!